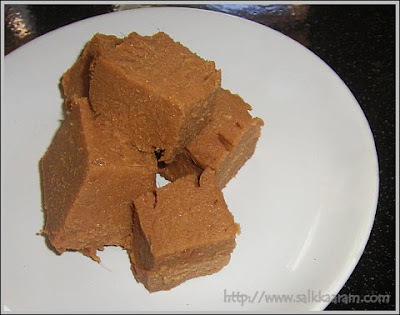 Thengin Pookkula Verakiyathu / Pookkula Lehyam | Simple and Delicious ! Widening of road to the land ended the lives of some coconut trees , last week. 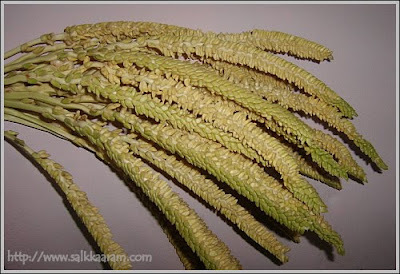 Normally when we need pookkula, ( bunch of coconut - tree flowers) we depend the "thengu kayattakkaaran" (worker who climbs on the coconut tree to pluck coconuts) but this time prepared since the pookkulas were available plentiful.Pookkula lehyam is considered as a medicinal food for post-delivary care, because it is very effective in reducing back pain and helps to regain health after delivery. I have already written some benefits of pookkula lehyam / pookkula verakiyathu in the coconut oil blog, if you want to know please have a look.The color of this porridge depends on the amount of jaggery / sarkkara / vellam used. coconut oil 2 Tbsp, if required. Remove the outer coverings of pookkula. Grind the pookkula well in the mixer grinder with enough water. It should be a thick solution without fibres. Blend coconut with enough water and extract the milk. 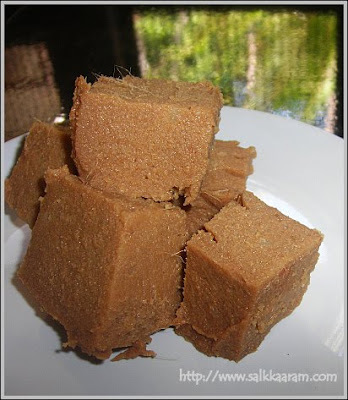 Melt jaggery in little water, remove the impurities by straining. Mix jaggery and pookkula juice with coconut milk. Heat it, and stir continuously. When this turns thick add rice powder mixed with water. Pour coconut oil if the dish it self doesn't turn oily. This is little long procedure. When the porridge gets enough thickness and removes from the pan itself, take away from the fire, allow to cool. The picture of a pookkula. Not this type uses for making pookkula lehyam, but the tender one in the green cover. Never tasted this Lehyam Seena although my grandfather owns a coconut farm near Mysore. Looks like yummy Burfi, good for us too. great post. This looks delicious! It must have tasted heavenly! wow! glad that u blogged this.. very unique aspect of our culinary heritage! If you add Methi (Fenugreek)powder half cup to this, it will become a good medicine for back-ache. However, it will become slightly bitter. May be the amount of jaggery can be increased.